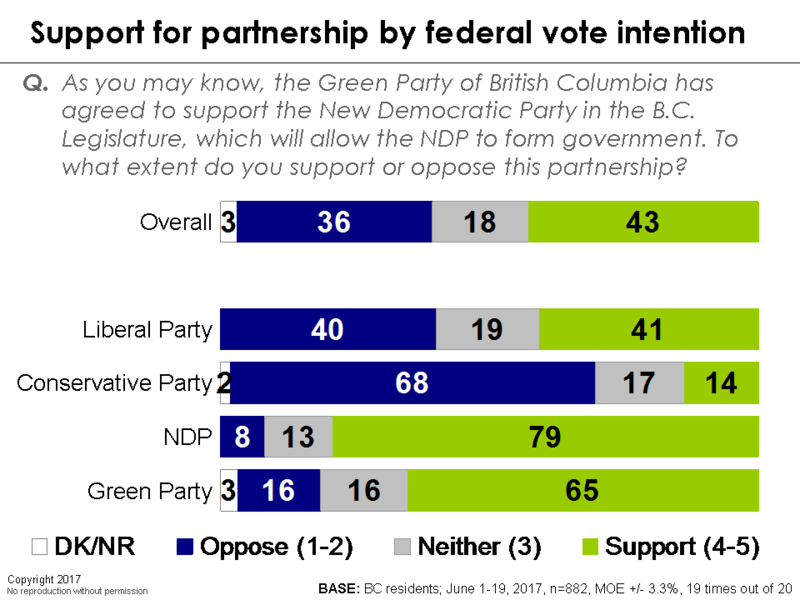 While we did not ask provincial vote intention in this survey, we can look at how support for the NDP-Green partnership varies by federal party support. Support is – unsurprisingly – strongest among federal NDP and Green supporters. Federal Liberals, meanwhile, are evenly split, while Conservatives are fiercely opposed (reflecting the fact that the British Columbia Liberal Party is more of a small-c conservative party, at least compared to its federal namesake). What is perhaps most striking about the underlying demographic patterns is the education gap. 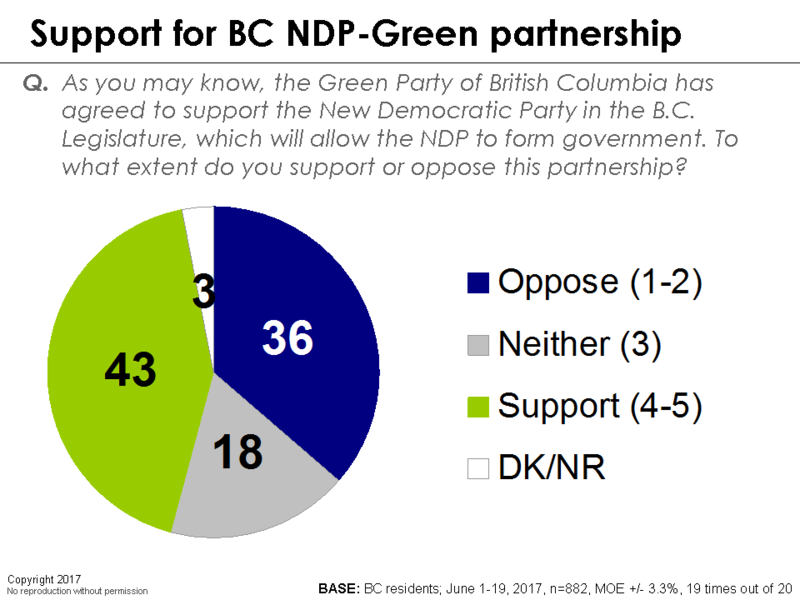 A majority of university graduates support the notion of an NDP-Green partnership while those with a high school education lean decisively in the opposite direction. The deal also finds comparatively greater opposition among seniors and men. The field dates for this survey are June 1-19, 2017. In total, a random sample of 882 adults aged 18 and over who reside in British Columbia responded to the survey. The margin of error associated with the total sample is +/- 3.3 percentage points, 19 times out of 20. Please note that the margin of error increases when the results are sub-divided (i.e., error margins for sub-groups such as gender, age, education). All the data have been statistically weighted by age, gender, and educational attainment to ensure the sample’s composition reflects that of the actual population of Canada according to Census data. Please click here for a PDF copy of this article. Kevin J. Keen, PhD, P.Stat. Were the field dates for the BC survey with publication date 29 June 2017 really 1 – 19 June 2016? Or was the year 2017? Kevin J. Keen PhD, P.Stat. Oops! That was most certainly a typo. The correct field dates are June 1-19, 2017. We have corrected the article in response to your comment.